Hampi (Vijayanagar) Bellary District: Ramachandra Temple Complex. 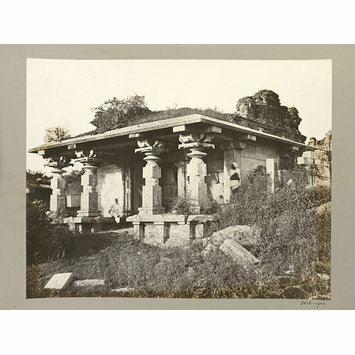 This photograph shows the Ramachandra temple complex (Vijayanagara). This photograph shows an oblique view of an enclosed, squat, stone structure with pillared porches to either side of a main entrance. The square structure sits on a basement with relief carvings and is mounted by simple eaves. The remains of an ornate brick tower indicate a more substantial roof structure originally. The squat columns have handsomely carved capitals and relief carvings on the flat surfaces. The foreground and roof are overgrown with vegetation and some stone blocks are strewn around. A blurred figure sits on the left porch facing the camera and another stands on the right porch, posed presumably to indicate scale. Another large ruined structure can be glimpsed to the rear in the right hand side of the photograph. This photograph shows the Ramachandra temple's main eastern gateway. Also known as Hazara Rama temple, this complex in the middle of the Royal Centre was built during Devaraya I's rule between 1406-22 and was the private place of worship for the Vijayanagara kings. To the east of this temple is a lamp column and a small Hanuman shrine. This entrance gateway opens into a walled enclosure where the temple stands. The temple is unique at Vijayanagara for the bands of relief sculpture on both its exterior walls and also the external face of the enclosure wall, just out of view in this photograph. The friezes display courtly scenes of processions. On the inner face of the exterior walls are found panels of relief carvings of the entire Ramayana epic. The whole epic is carved again on the outer walls of the principal mandapa.The image clearly shows the remains of a brick and mortar superstructure over the gateway pictured. For related views of the Ramachandra temple complex, see 3805-1910, 3806-1910, PDP 3796-1910, PDP 3807-1910 and PDP 3818-1910. 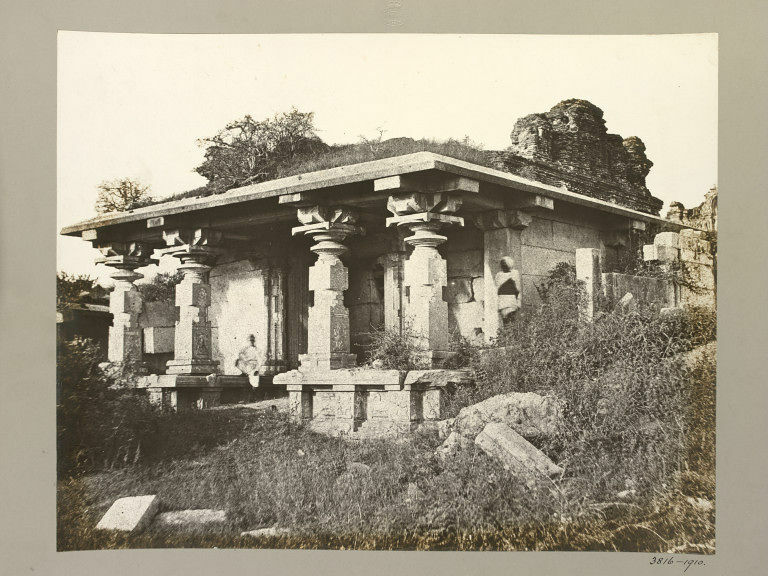 This photograph is significant as the earliest known photographic record of this structure before substantial reconstruction was undertaken. The image clearly shows the remains of a brick and mortar superstructure which is now completely missing.